Joel Rosenberg must be getting tired of being right all the time. Called a “modern day Nostradamus” by US News and World Report, his Tom Clancy-like political thrillers have the added attraction of being based on End Times biblical prophecy. As such, some of the events he has described fictionally in his novels have come to pass in reality with eerie precision. Nine months before the infamous events of 9-11, he finished his first book The Last Jihad in which he described a hijacked plane being used for a suicide attack on an American city. 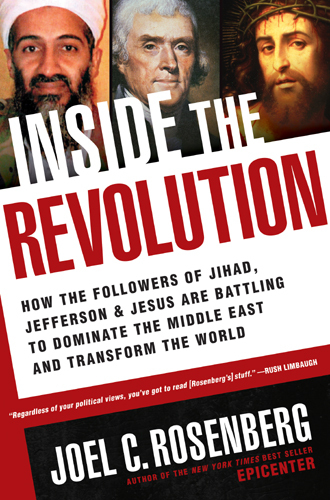 Well, it looks as if another key event in Joel’s Last Jihad series may be on the edge of making the jump from fiction to fact. In his forth book, The Copper Scroll, Joel writes of the deciphering of an ancient metallic text that reveals the location of the implements and artifacts necessary for the rebuilding of the Jewish Temple on its historic site. 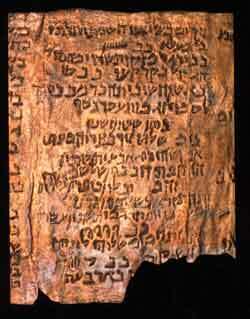 The Copper Scroll is an actual archeological find. It purportedly tells where the prophet Jeremiah hid not only vast treasures, but also even the Ark of the Covenant before Solomon’s Temple was destroyed by the Babylonians in 586 BC. A column of the Copper Scroll, one of the Dead Sea Scrolls found in Cave 3. The problem with the Copper Scroll was first how to unfold it wthout destroying it. 2,600 years of age would render anything very fragile. But working with high tech precision cutting tools, the scroll was recently opened without destroying the message. But this created another problem. The ancient style of Hebrew used and the seemingly obscure landmarks sited lead some scholars to believe that it would be impossible to actually determine where the treasures, estimated in the billions of dollars would be located now. His outlook on the find changed one morning in December 2006. Following a conversation with Vendyl Jones, a man rumored to be the inspiration for Spielberg’s Indiana Jones, and who himself had been searching for the treasures listed on the artifact, Barfield chose to revisit the ancient text. When investigating arson, he tried to prove everyone innocent by eliminating the fringe factors. This experience served him perfectly with the scroll. “I eliminated the fringe and matched up the fingerprints,” he said. After looking at the scroll for five minutes he deciphered the first location, and twenty minutes later he identified the next four locations. He and his wife took their first trip to Israel to confirm whether the sites and places that he had identified actually existed. “I wanted to make sure I wasn’t just imagining things,” Barfield said. It took six months for Barfield to crack the code for the rest of the locations. BARFIELD SAYS he is 99 percent certain that he has identified 56 of the 60 locations of the Copper Scroll; the other four he maintains only slight reservations. He readily admits, however, that he can not be sure the sites have not already been found and looted over the last 2,000 years. Between 160-200 tons of gold and silver potentially lurk under the Judean hills and Negev sands. Their estimated worth is over $2 billion today. Whatever the tonnage may be, the significance of the archaeological discoveries would be far greater than any monetary value. Barfield notes that the Copper Scroll offers the greatest chance ever to locate lost sacred objects used for worship in the first Jewish Temple. Both Barfield and Knight describe themselves as Torah observant Christians with a sincere love for Israel and the Jewish people. Their central desire in getting involved with the Copper Scroll was to return the treasure of the Scroll to its rightful owners: the nation of Israel. In a phone interview with Barfield we discussed the implications of actually finding something on the expedition. I also noted that the finder’s fee for such an achievement would be considerable. “If God has selected me to do this,” Barfield replied, “He gave it to a guy that just doesn’t give a darn about wealth. “My children and grandchildren love God and I just want it to stay that way,” he continued. “I want to return these items to Israel and what they do from that point is up to them. What would happen if Barfield’s work pays off? As we have noted in this space, according to Israel’s YNet News a recent poll indicated 64% of Israelis want to see the Temple rebuilt. What would happen if such an astounding series of discoveries took place? The Bible makes it plain that the Temple will be rebuilt in the Last Days, probably as a part of a comprehensive seven year peace treaty brought about by the Anti Christ. But could we be seeing another major part of the prophetic puzzle coming into place? And how interesting that God would raise up a simple, born again Christian to show the people of Israel what conceivably could be her greatest treasures? Joel Rosenberg along with Lt. General Jerry Boykin will be hosting a nationally broadcast Town Hall Meeting this coming Friday, September 11th at 7pm. Calvary Christian Fellowship of Tucson along with over 600 churches across the country will be hosting a satellite hook up. We will also be having Joel on as a special guest on our Scott Richards Live broadcast this Thursday, September 10th at 5 pm, Arizona time. Joel has graciously provided a link where questions can be submitted by those who will watch the broadcast. I personally would love to hear what Joel’s take is on these intriguing developments concerning the Copper Scroll. Click here is you would like to submit a question concerning this issue, Biblical prophecy or the challenge the church faces in reaching out to the Muslim world with the love and truth of Jesus. Click here if you would like to follow along with Jim Barfield’s continued research on deciphering the Copper Scroll.